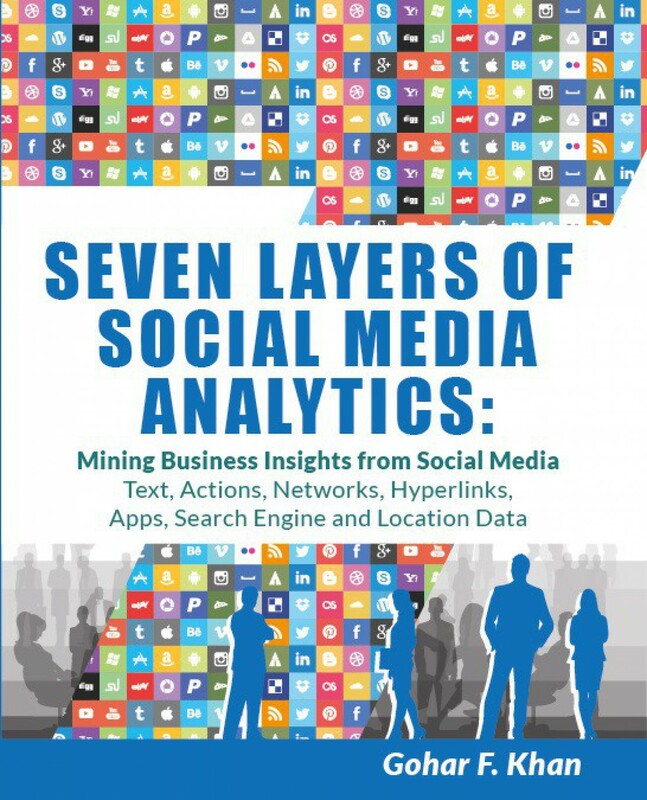 Seven Layers of Social Media Analytics: Mining Business Insights from Social Media Text, Actions, Networks, Hyperlinks, Apps, Search Engine, and Location Data by Gohar F. Khan offers concepts, tools, tutorials, and cases studies that business managers need to extract and analyze the seven layers of social media data, including text, actions, networks, apps, hyperlinks, search engine, and location layers. Social media analytics is about converting unstructured social media data into meaningful business insights. By the end of this book, you will have mastered the concepts, techniques, and tools used to extract business insights from social media that help increase brand loyalty, generate leads, drive traffic, and ultimately make good business decisions. The book is non-technical in nature best suited for business managers, owners, consultants, students, and professors, etc. A separate chapter is dedicated to each layer. Here is how the book is structured. Chapter 1: The Seven Layers of Social Media Analytics—this chapter sets the theme for rest of the book and introduces seven layers of social media analytics, discusses the typical steps needed to carry out the analytics, challenges, and tools of social media analytics are discussed. Chapter 2: Understanding Social Media—before diving into the seven layers of social media data, chapter 2 briefly discusses fundamental social media technologies, their properties, and main stream social media tools, including, blogs, wikis, social network sites, content communities, and folksonomies. Chapter 3: Social Media Text Analytics—chapter 3 is dedicated to Text Analytics, the first layer of social media analytics. A variety of textual elements of social media is discussed along with the steps needed to carry out text analytics, its purpose, and the tools of text analytics. The chapter also includes a step-by-step guide on analyzing social media text (e.g., tweets and comments) using Semantria for Excel. Chapter 4: Social Media Network Analytics—networks are fundamental parts of social media. Chapter 4 deals with network analytics and seeks to identify influential nodes (e.g., people and organizations) and their position in the network. Social media networks, for example, Facebook friendship network and Twitter Follower network, and YouTube commenter’s networks are discussed. The chapter also includes a case study and a step-by-step tutorial on NodeXL for analyzing social media networks. Chapter 5: Social Media Actions Analytics—chapter 5 decomposes the third layer of social media analytics i.e., the Action Analytics. The chapter explains extracting, analyzing, and interpreting the action performed by social media users such as, likes, dislikes, shares, mentions, and endorsement. The chapter also includes a case and a step-by-step tutorial on Hootsuite analytical tool is provided. Chapter 6: Social Media Apps Analytics—mobile applications are the next frontier in the social business landscape. Chapters 6 deals with mobile analytics and marketing issues. A practical tutorial on analyzing and understanding in-app purchases, customer engagement, and demographics are included in the chapter. A practical tutorial on Countly apps analytics tool and a real world case study is also included as part of the chapter. Chapter 7: Social Media Hyperlinks Analytics— Social media traffic is carried out through the hyperlinks embedded within it, thus hyperlink (e.g., in-links and out-links analysis can reveal, for example, internet traffic patterns and sources of the incoming or outgoing traffic to and from a source. Hyperlinks analytics is discussed in chapter 7. A real world case study and step-by-step guidelines on hyperlinks analytics using VOSON is also included. Chapter 8: Social Media Location Analytics—chapter 8 deals with location analytics which is also known as spatial analysis or geo analytics. The chapter outlines tools and techniques to mine and map the location of social media users, contents, and data. A real world case on mining mobile phone data and a step-by-step guide on geo-mapping your tabular business data using Google Fusion Table is also provided. Chapter 9: Social Media Search Engine Analytics— this chapter explains search engine analytics. Search engine analytics focus on analyzing historical search data as to gain a valuable insight including trends analysis, keyword monitoring, and advertisement spending statistics. Practical step-by-step guidelines are provided using Google Trends to analyze search engine data. Chapter 10: Aligning Social Media Analytics with Business Goals—Configuring and understanding social media tools alone is not enough, to get most out of it, analytics should be alleged with business strategy. Chapter 10 will discuss strategies and techniques to aligned social media analytics with business goals. A discussion and framework on social media risks management is also part of the chapter. The book is available at Amazon Store and CreateSpace Store.